This month’s inspiration was to use white on white. A touch of colour or neutrals were permitted. I decided to go with ivory on ivory since the music paper I used as a base for my flower wasn’t was vintage and not white any more. This was a very hard card to photograph. The top, further away and at a deeper angle to my lights turned out OK, but the bottom faded away to almost nothing. Ugh. On top of the ivory, I added a bit of yellow shading to the music rose, green to the leaves and flourishes and pink to the small roses. All flowers are handmade. I used a Cuttlebug folder for the embossing around the card to add dimension. Then I added more dimension with the picot circle die cut, flourishes foam dotted so they aren’t just popped up but are flat at one end, one layer foam dotted one third of the way down and double layered 2/3 of the way down so the end sticks up quite nicely. When you can’t use colour for contrast, you have to look for other ways to get dimension. This card is over 1 and a half inches thick; maybe closer to 2”. It won’t even fit into a card box to be delivered. It will require hand delivery for sure! The sentiment says “Sending our Thoughts and Prayers”. I am also going to enter this into the Shabby Tea Room Challenge to add a new card or your favourite of 2012. I have several favourites from 2012 but why not enter a new one? I hope you enjoy the rest of the hop. If you liked my project I hope you will visit again and subscribe, the sign up thingies are on my sidebar. Thanks! Ink: Scattered straw, spun sugar Distress, moss-PTI, pink pirouette-SU! This card is super gorgeous!! 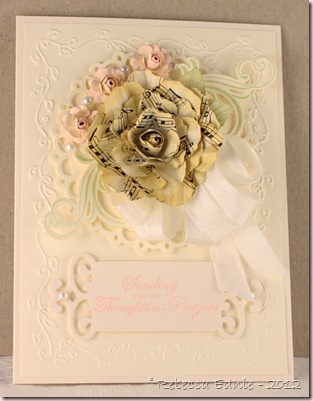 I LOVE the roses, the embossing, the ribbon, the whole thing is simply elegant! 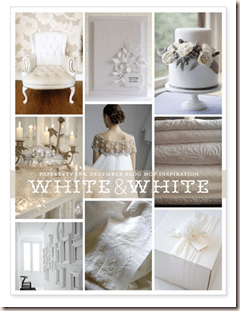 Love ivory, always great for a vintage look! Just beautiful! 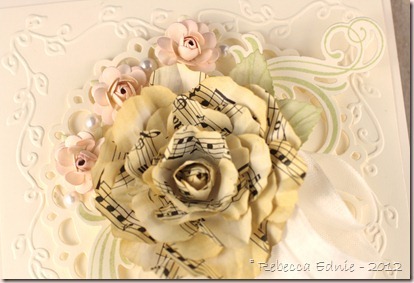 I love vintage music paper… I would use it on everything if I could… But I love how you used it as your focal point. Lovely card! My photographing of my entry didn't come out that great–hard when it's white–actually, hard no matter what for me–LOL! Just gorgeous ~ love the beautiful flower! A beautiful card indeed! I love the handmade flowers, perfectly made. Gorgeous flowers! I'm a sucker for anything with vintage sheet music & just love your big flower. Beautiful flower and I had a difficult time photographing my card, too! Love your design! Very pretty! I love that largest flower!! Your card is stunning rich and very elegant! I had a hard time photographing my card as well. I can see all the beautiful detail on your card. Ooh. So vintage! Love it! how beauiful! love the music paper! !